At the moment, the main active groups in Laos are coming from Europ. There is no Lao caving association, although there are attempts to encourage local initiatives. As proof of the good health of the Lao speleology, communication between groups is very active and “exchanges” of team members are frequent. 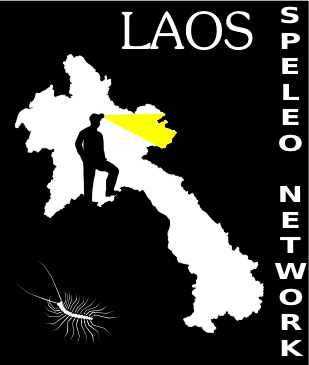 The Explo-Laos group (this web site) was created in 2009 from the association of most of the former teammates of C. Moutre. In the last seven years, the group explored and mapped over 100 kilometers of caves, including the Nam Dôn-Houay Sai cave system, longest cave in Laos (45 km). The Northern Lao-European Cave Project is a joint venture of our friends Michael Laumanns and Joerg Dreybrodt, mixing deutch and german cavers and a bunch of other foreigners. Starting in 2000, they conquered most of the karstic regions in the north of Laos, except the Vang Vieng area, still a stronghold of french cavers. In 2010-2011, they explored Tham Chom Ong (18.4 km, Oudomxai province), third longest cave in Laos. They had also the privilege to study and map the historical caves around Viengxai (Houaphan province), used by the Pathet Lao resistance to hide from the intense US bombing during the second indochina war. Over 100 km of caves have already been explored and mapped. Myanmar is now an ongoing target of their explorations. The Cave divers group is a french-romanian team, with Richard Huttler, Marin Tudor and Laurent Mestre as historical leaders. Present in Khammuan since 2006, and in Vietnam more recently, they have explored many sumps and connected a number of caves, including the Nam Non - Song Dang system, making it the second longest cave in Laos. Working in close cooperation with Explo-Laos, they are exploring the sumps of the Nam Dôn-Houay Sai system, connecting the different parts of the cave. The French-Italian cavers group, coordinated by Marc Faverjon, makes regularly explorations in Khammouane and Vietnam. After a series of expeditions starting in 2002, on the Nam Pakan river, they explored the karstic area north of the Xe Bang Fai river cave in 2010. The EEGC group is also active around Vang Vieng. In 2016, a japanese team, with Yuriko Chicano as correspondant, has undertaken the exploration of the karst around Lak Sao, north of Khammouane and border with Bolikhamsay. Several expeditions have been effected by Liviu Valenas with the help of his Thaï wife and a few friends, in the Pha Soung area, a small limestone outcrop, just opposite of the Nam Dôn cave system, that hosts a maze of about 15 km of passages partially explored a few years before by the french teams of Gondras & Faure and Espinasse & co (see below). A team of lithuanian cavers, led by Raimondas Daniunas has been exploring the south-west border of the Khammouane karst from 2013. Their main discovery so far seems to be the Aenigma cave system (4.6 km), at the entrance of the Phon Tiou valley (tin mines). The year after, in 1998, a smaller team, led by A. Espinasse (with Frank Bréhier, F. Auber and D. Sablé) was back. They explored the Nam Dôn resurgence area, the Nam Hin Boun lower valley and the Ban Nakhanxang area, not far from Thakhek. In 2000, another cave diving expedition, led by Gilles Morieux and H. Foucard (with A. Espinasse, Pierre Jouan and Lionel Aubert) targeted again the Nam Hin Boun valley. Among others, they explored the Houay San Boun cave (2273 m), found a few years later to be the emergence of Tham Thon, a major lao through-cave, further east. After a quick visit in 2006, John Pollack and Bob Osburn organized a one week mapping expedition on the Xe Bang Fai cave (Tham Khoun Xe) in 2008. This adventure has been reported in a superb NSS paper. In 2015, the team went back to the XBF to finish the survey. A duo team with Bernard Faure and Emmanuel Gondras (Furets Jaunes de Seyssins caving group) explored the area east of Thakhek and around Ban Na in december 2009. Sadly, but not surprizingly, Claude Moutre and JF Vacquié, although among the historical cave explorers in Khammouane, are now alone to continue their explorations, after a series of harsh relational problems with their former team mates. Other past explorers are presented in the History section of this website.